...which is so creamy, cheesy, and truly irresistible for children and adults alike. This has the same cheese topping as the Baked Macaroni that I've shared here before, wherein I used 3 types of cheese: parmesan, cheddar and mozzarella. Though the Filipino-Style Spaghetti is pleasing enough to eat as is, this baked version takes it to a whole new level. Baking it not only let the spaghetti absorb more flavor from the sauce, it also makes it extra comforting because of the added gooey cheese! 1. Cook the spaghetti pasta al dente according to package directions. Be sure not to overcook. Drain and set aside. 2. Prepare the meat sauce. In a large saucepan over medium-low heat, cook beef in ¼ cup water until water has evaporated. Drain any oil from beef. Push beef into one side of the pan. Add olive oil and saute garlic until light brown. Add onion and saute until translucent. 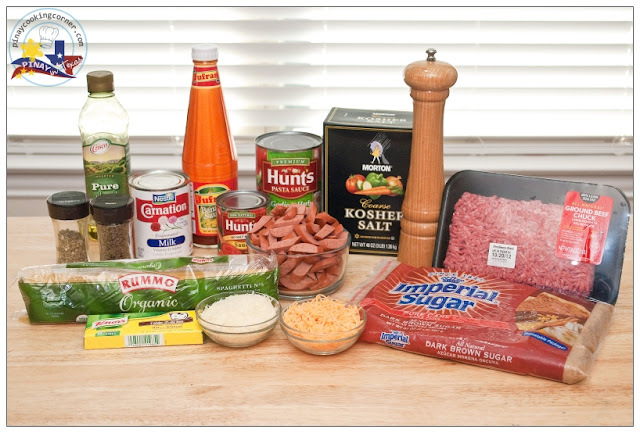 Add beef franks. 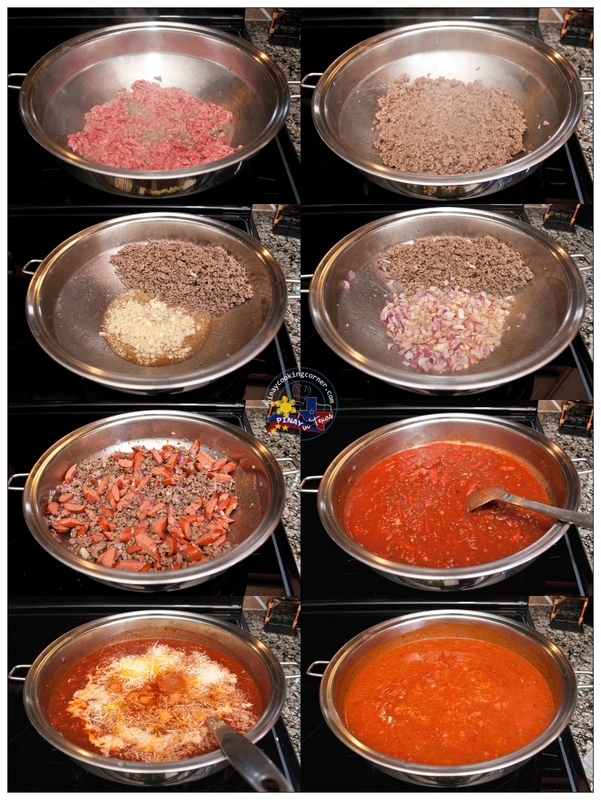 Mix ground meat together with garlic, onions and franks. Add beef cube and keep stirring until it melts. Pour the spaghetti sauce, tomato sauce and ketchup. Simmer for 10 minutes. Add sugar and mix well. Simmer for 3 minutes. Add milk, parmesan and cheddar cheese. Add salt and pepper to suit your taste. While stirring, continue to simmer for 5 more minutes. Remove from heat and set aside. 3. Prepare the cheese topping. In a saucepan over medium low heat, melt the butter. Add the flour and stir until dissolved. Whisk in the milk and garlic powder until the sauce thickens. Add salt and pepper to suit your taste. 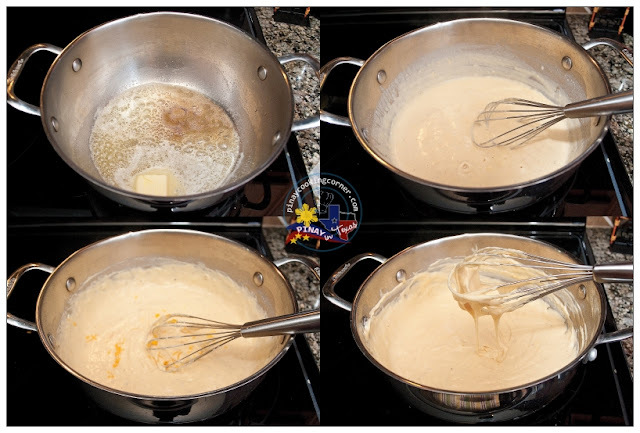 Stir in 1 cup of parmesan and 1 cup of cheddar cheese and whisk until melted. 4. Preheat oven to 375°F. 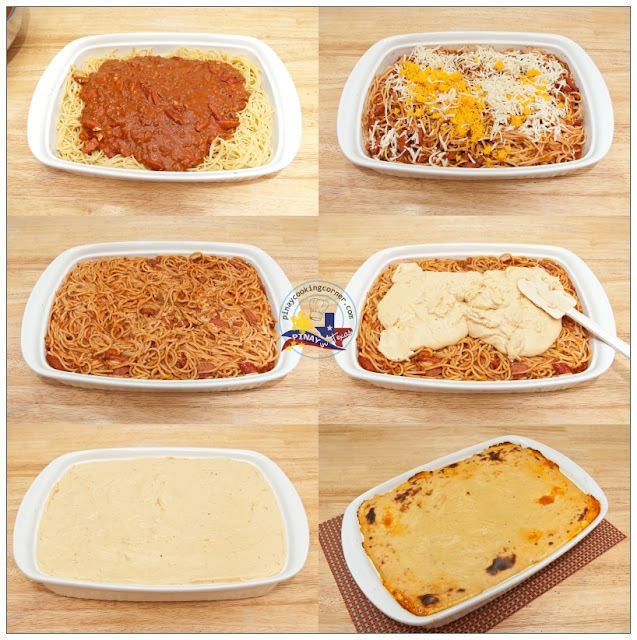 Combine the cooked spaghetti and meat sauce in a 13"x9"x2" baking dish. Toss until pasta is well covered with sauce. Add mozzarella cheese and the remaining cheddar cheese and toss some more. 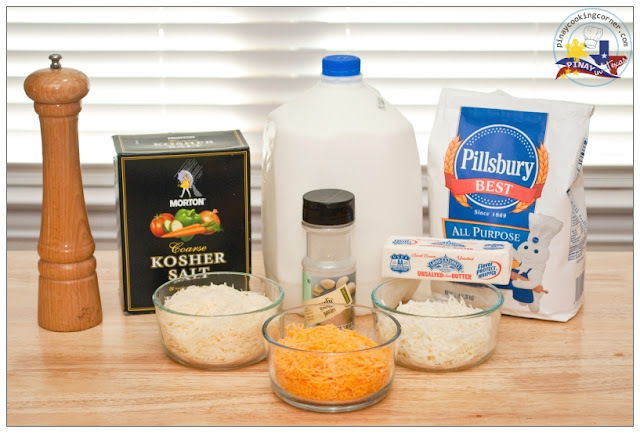 Spread the cheese topping evenly over the mixture. 5. Cover with foil and bake for 15 minutes. Remove cover and bake for 10 more minutes then broil at 450°F for 3-5 minutes or until topping starts to turn brown. Remove from oven and allow to cool down a little. Serve warm. what a creative way to make spaghetti. I bet kids would just love your version! Truly Pinoy and truly delicious! It's so nice to see that you used most of the proper Filipino ingredients in your spaghetti. I'm not surprised that your family loves it so much. it looks almost like lasagna! I'm sure this tastes yummy! Looks like lasagna :) Good luck to your contest! Tina, u may wanna Learn How To Whip Up A 5-Star Fish Recipe With Martin Yan! See u there! Oh yum... This looks delicious!!! My family would just love this! Very interesting and innovative baked spaghetti. Oh Tina, this is absolutely delicious! a combination between bachamel and spaghetti. Divine. Hi Tina, interesting recipe, something new to me. But it look awesome and appetizing. Thanks for the recipe and step by step pictures. 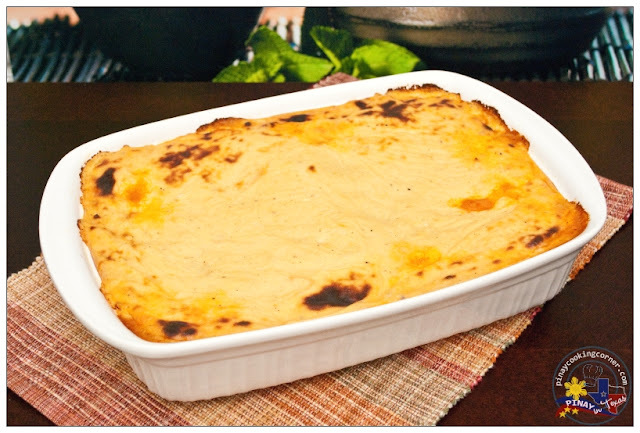 In Greece we make something very similar and we call it Pastitsio! 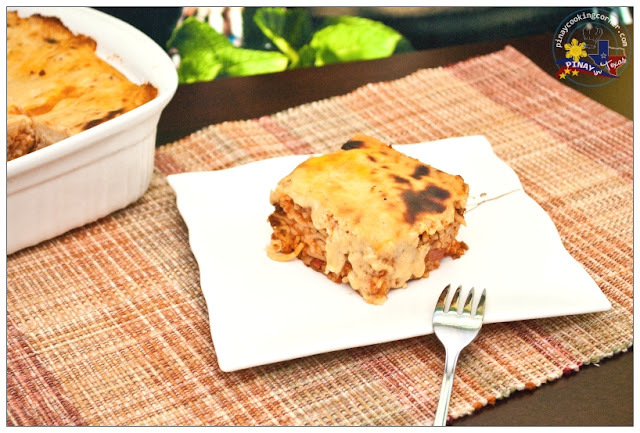 We all love pastitsio and I am sure we would love this version as well! Looks delicious and creamy rich, awesome Meal Tina. Love your take on the pinoy spaghetti, very interesting and looks delicious! Total comfort food! Beef franks - really? :) Now that's a first. I've got to find some banana ketchup. All of the flavors really look like they make a very tasty and delicious dish! I bet there were no leftovers. Hmmmm.. 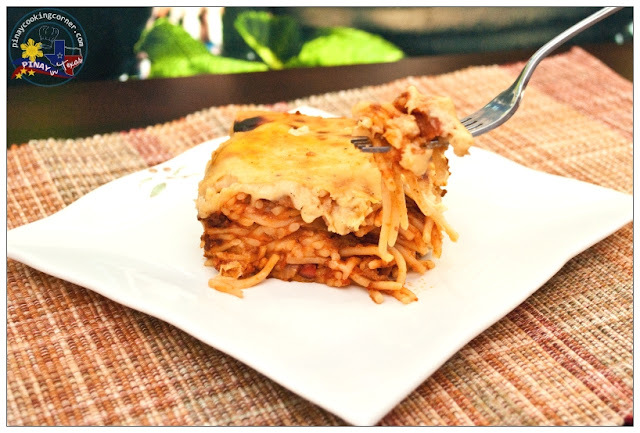 I wonder why I haven't tried to bake this Spaghetti.. Love your take on the challenge! Tina, your baked spaghetti is so delicious! I love the heavy cheese topping you made & I'm dying of hunger reading this. Thanks for sharing a great recipe and thanks for the kind comments on my blog ! Like the idea of adding hotdogs...I will give this a try next time making spaghetti. Tina, this looks great with the cheesy topping...definitely kid friendly food! I'd love it, too. What a lovely looking dish, baked spaghetti with loads of cheese is something my boys would love wholeheartedly...yum! Looks delicious! Its like layering of lasagna strips. I gonna try this recipe on my daughter's birthday tomorrow Thanks for posting this recipe. I'm sure my kids love this. More power to you.